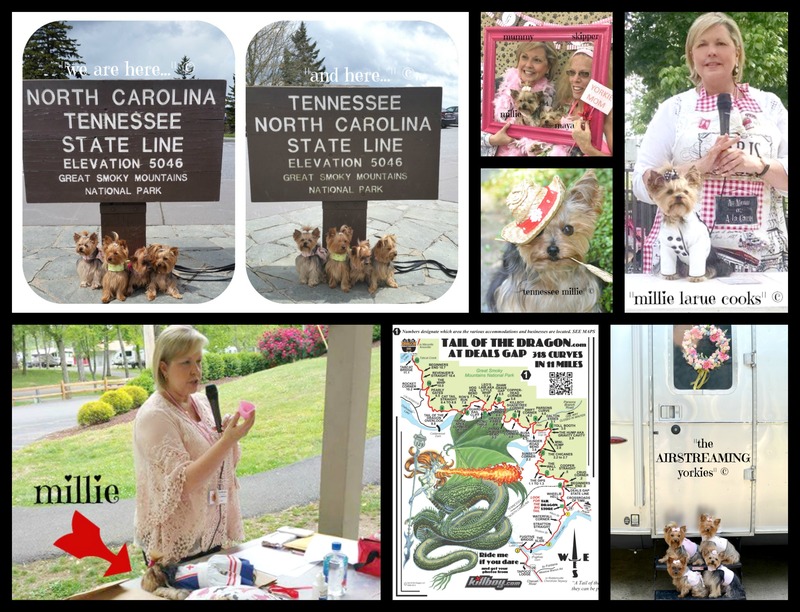 For the past year, Mummy and I had teamed up with Ms. Skipper and her furbaby, Maya to plan a HUGE YORKIE JAMBOREE. It was going to be held in Pigeon Forge, Tennessee and would take place over four days. The attendees and their little doggies (all small breeds were welcome, not just yorkies) could camp in tents or trailers or make reservations at area hotels or condos. We had around 100 people registered for the event… WOW, I sure hoped that we could pull this off! Throughout the year Mummy and I had been researching topics for two “optional” lectures that we would present. One class would be health-related, and the other was of course, a cooking class! The cooking class was easy because we would make doggie items from my famous cookbook… but Mummy still needed to work on the speech, and she got soooo nervous when she spoke in front of large groups!!! The health class would be more difficult. We needed to choose a topic that was relevant to this group of mommies… and we finally decided on “traveling with your furbaby.” There was lots of research and work to be done in preparing for this, and we decided to also hand out a little first-aid bag to each person in the class, which we would then fill with a few necessary supplies. In addition to the classes, we needed to gather lots of items for the 100 WELCOME BAGS. Mummy and Ms. Skipper spent hours and hours on the phone and sending out emails, asking for donations… the work was never-ending. It was a basically a full-time job that you volunteered for, but our hopes were that it would be a great way to get lots of doggie moms together in one place and share some fun memories. Money was also being set aside to donate to a local shelter group in the Pigeon Forge area, and everyone was asked to bring an item that the shelter needed… like dog food, blankets, water bowls and other necessities. Many of the people attending the event knew each other from Facebook, but had never actually MET in person… so this would be SO FANTASTIC. The mommies were hoping and praying that everyone would love the ideas they had planned… a WELCOME party, shopping trips, a tour of a local moonshine establishment, S’mores night around a campfire, an outdoor BBQ lunch, Mummy’s optional classes, and an outdoor movie for the final evening… complete with popcorn and soft-drinks. There was even a DOGA CLASS (Yoga for doggies) for those who were interested in attending. This would be the first big trip that we took in our new AIRSTREAM and we were excited. There would be LOTS of work for the mommies to do, but the DADDIES would be there too and we would be putting them to work!!! We left a few days ahead of time and planned to spend it camping beside a small river in Hiawasswee, Georgia. Mummy wanted to relax a bit after the long year she had spent planning for the upcoming event… just a few days was all she needed. We toured the local area, took long meandering walks by the river and even saw a few BEARS from the safety of the backseat of our car, and then it was SHOWTIME. We headed off to Pigeon Forge… it was time to see how everything would fit together. For the entire year, Mummy and Ms. Skipper had only spoken to each other via texts or phone since we don’t live anywhere near each other. Now it was D-Day! We would soon find out if all of their jobs would now seamlessly meld together into ONE COHESIVE PARTY! Had we remembered to pack everything? The truck was filled to the brim with boxes, so I certainly hoped so. Did Mummy have her speeches perfected and all of the supplies ready for our classes? It was too late now if she had forgotten anything. The STRESS was almost unbearable. I could feel Mummy’s pain but could do nothing except lick her face, which was my way of assuring her that things would be fine. We headed up the mountainous roads, some of them barely wide enough for two cars to pass each other. At times, the side of the AIRSTREAM was almost scraping against the mountain walls and Mummy would SCREAM. At other times, we were at the edge of the road, with Mummy looking down the side of the mountain, and she would SCREAM again. Basically, it was a drive filled with SCREAMS. The windy road was unyielding for people pulling trailers. As the road got worse and worse and cars piled up behind us, even Daddy began to get nervous. Occasionally, there would be a small pull-out where we could stop and let the traffic go around us… which was very much appreciated. We could feel ourselves climbing, climbing, climbing ever higher into the heavens, and the truck was groaning with every turn. Before too long, we noticed photographers set up at every bend in the road. They were positioned everywhere… taking the picture of every car that passed. WHAT’S GOING ON HERE?!?!?! It would be later in the afternoon, when we FINALLY arrived at our campground and checked-in with the manager, that we discovered what we had just done. We had taken the WRONG route to get to Pigeon Forge. We had just survived “The Tail of the Dragon”… which is a thrill road for motorcycles and smaller cars. “The Dragon” consists of 318 turns within 11 miles, and we had felt every one of them!!! Big trucks and trailers are NOT supposed to be on that road due to the width restrictions and difficulties in the terrain. WHO KNEW??? Apparently, a sign was posted as you enter “The Dragon,” but we had missed the sign. The photographers are set up on the route every weekend taking pictures of vehicles that travel the road, and you can order one from their website. OMGOSH! We had driven “The Dragon,” pulling a trailer… but we would NEVER drive it again! Not for ANY REASON!!! That week, the Jamboree progressed exactly as planned and we had one more event to go… outdoor movie night. We had ordered a ton of popcorn from a local company and had a huge assortment of soft-drinks. About an hour before show-time, Mummy went to pick up the popcorn while the manager of the campground (which is where our events had been scheduled) came to set up the video machine for our movie. It would be set up in the huge conversation pit where we gathered for social activities, and projected onto the huge stone wall that surrounded the area. It was PERFECT! Everything was all set to go when the unthinkable happened… it started to sprinkle. And then it started to RAIN. And then the movie had to be cancelled. OH…the disappointment of it all!!! Most people returned to their rooms and began packing their things, in preparation for departing the next day… but about a third of the group gathered under the pavilion in the pouring-down rain for a final evening of laughs. Mummy and Ms. Skipper passed around bags and bags… and BAGS of popcorn! You have never seen so much popcorn until you have seen what 100 servings of popcorn looks like!!! For a week afterwards, Mummy and Ms. Skipper were still snacking on left-over popcorn, and when it was finally gone… Mummy said that she’d NEVER eat popcorn again… which were honestly words I NEVER thought she would ever string together in the same sentence, being the popcorn lover that she is! The “CYL Smokey Mountain Jamboree” was over, and it had been a HUGE SUCCESS! Everyone had a great time and by week’s end, we were all EXHAUSTED! The daddies had been lots of help too… running to the store when we ran out of drinks or ice, and lugging boxes back and forth to the pavilion for classes. Fires had to be built, food had to be set out and stuff had to be cleaned up… but with the help of so many wonderful volunteers attending the event, we managed to get it all done. This yorkie group was just the best group of mamas and daddies, and we were going to miss them after we left… but we would see them again, because we were already planning on doing it again NEXT YEAR! Mummy and Ms. Skipper were on the phone with each other as we drove away… already planning the next event. Where would it be? What theme would we have? What about the classes? OMGosh, I can’t believe we are doing this again! ***All rights reserved. No part of this publication may be reproduced in any form or by any means, electronic or mechanical, including photography and information storage and retrieval systems, without permission in writing from the author. ***There is a delay in the posting of comments due to the way our system is configured. We love hearing from our friends and hope that you will be patient with us. Your sweet comments will be posted as soon as the system has run its checks. So cool to read about that Jamboree!! I was not part of the CYL group yet at that moment!… But from now on.. I will not miss any Jamboree!! Millie Your Mummy and Skipper Rocks!! 😉 Big Kiss!!! Well some day I would love to go to the Jamboree but as you know I live a very far way from there and I don’t have any trailer to stay and I have 4 DOGGIES! just impossible for me to travel really without a trailer well I am thinking I’d like a small motorhome I don’t need as much room…. at least that’s what I’m thinking. LOL I’ve had trailers before and even pulled a trailer myself so I’m already camping savvy!!! I see you are wearing your nurse uniform and chef outfit. They are so cute! Did mommie make those outfits for you and do your sisters also have nurse and chef outfits? I’ve been on the tail of a dragon in a car and I still don’t wanna go back! I didn’t get to go to the pigeon forge jamboree but I’m sure it was phenomenal. Every class that your mommy has ever taught that I’ve been to has been great! What a lot of effort that everyone put into that!